Squash House Quilts: There's a New Girl in Town! 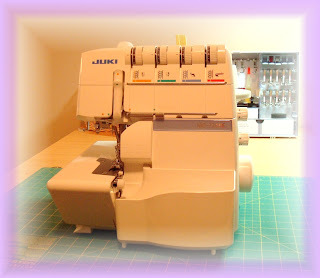 Move over Bernina cousins (all three of you that reside at the Squash House) - meet the new Juki girl! Yes, I made the plunge! I was going to stick with Bernina, but since Juki makes Bernina sergers and the price it a LOT lower, I said what the heck! I don't have her set up just yet as I am waiting to make sure I get all that I purchased from the vendor on eBay. This hasn't been an easy transaction! When I clicked on "Buy It Now", the auction said there were 4 available. I paid immediately with Paypal and since we were going on vacation the next day, I asked the seller to hold the shipment until we returned. Well, nearly 3 weeks after we returned, and a phone call and several emails later, I was told that the sellers supplier was out of stock! Can you believe it? Another week passed and I finally got delivery.....however.....the deluxe accessory kit that contains ALL the feet for this baby was not in the box. Another phone call, several emails and I was told that they thought it came with the machine, but realized after all that it didn't! No siree, you don't say that to this girl and get away with it! I explained that the auction clearly stated it was included and I expected to get it! I am now told that it has been ordered but Juki is in the middle of a move and it may be a week or two before it arrives! I explained that it better arrive or I will file a dispute with eBay. So....I am hesitant to completely unpack it until I get everything! It will be returned if they don't follow through and I will find another seller that includes everything as they stated. In the meantime, I saw that serger thread was on sale at Pacific Fabrics! These cones are normally $4.99, but on sale now for $2.99. Plus it is also Pacific Fabrics "silver club day" (eek - that means I'm over 55) and I got an additional 10% off! When I got to the checkstand she said she would probably be giving me money - ha, ha! I have no idea if this is good thread for the serger, but for the price, it gives me something to use while I get to know the machine. If anyone has suggestions on serger thread, feel free to suggest away! Please send positive thoughts my way for getting that deluxe accessory kit! I've had my Bernina 2000D serger for years and only use the Maxi-Lock. No problems at all--not even a "hiccup". Whoa girl. Tenacious is your middle name. good for you. Give that seller a run for their money!!! I've never serged. All those cones of thread scare me. I'm such a chicken. Des, you are so right - I always try to give what I offer and hope that others do the same! I'll admit, I'm a little scared of those cones, too, but I went to a Bernina club (we call it "Bernina Party") at my dealers and we had a project that involved serging - I was immediately hooked! There have also been countless times in the past where I really wished I had a serger for certain home-dec and clothing projects, so I made the commitment to take the plunge! On another note, I just love your Blog. I'd give it an award but those things drive me nuts. Hi Candace, I hope your accessories arrive quicker than you were told! 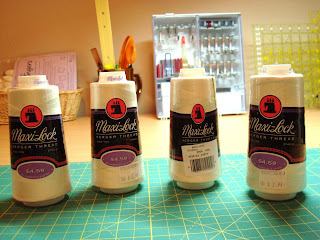 I have used maxilock thread on my serger and have not had a problem, however, I seems a little scratchy to me when I've used it in an area that will be close to my skin. I'm thinking of buying a better quality serger thread for clothes that will be close to my skin so I'm not scratching at where the seams touch me! Recipe for a Hot Dog Party! Suggestions...A Finished Work...and a Drawing! Mountain Loop Fly Fishing - Give-Away Reminder! They told me this would happen….